I'm hoping to track down two specific and memorable but elusive cartoon strips. The first is a Beau Peep strip featuring the Nomad (which I've described in the relevant forum). 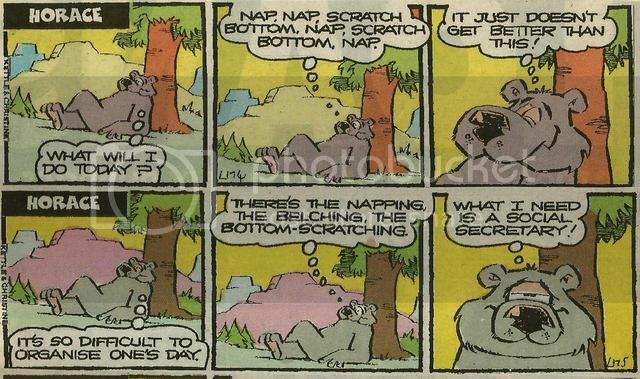 The second cartoon strip I'm after features "The Bear" in "A Man Called Horace". After months of inactivity, the Bear has finally emerged from hibernation and is contemplating what to do outdoors in the Spring sunshine, he opts for lying down and scratching his bottom. Any assistance in helping me track down this specific strip would be much appreciated. I probably wrote about a dozen of those! Maybe Rob Baker can help narrow it down. When you see them all together like that, you have to admire Mr Kettle's stunning ability to stretch an idea beyond breaking point. Thank you, Rob, for being such a sad, sad anorak! Really enjoyed that. I read them all and even the last two made me laugh. Bravo! Rob, many thanks, as always, for the remarkable amount of work you put into stuff like this. It really is appreciated. Not financially, of course, but, you know, from the bottom of my heart. The scratched bottom of my heart. Can I just add, in my defence, that the sequence of near-identical jokes above are what's known as a "running gag" in the comedy business. And definitely not "lazy crap when you can't think of anything else and there's a deadline coming up and your cat's just died." And definitely not "lazy crap when you can't think of anything else and there's a deadline coming up and your cat's just died." Your cat had fifteen lives?